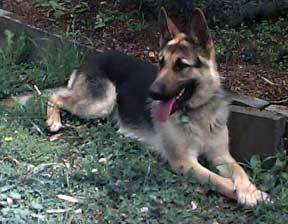 German Shepherd health is a very critical issue. German Shepherd health is one area over which you have a lot of control. Long prized for its elegance, intelligence, loyalty, versatility and working abilities, the GSD can be a very stoic animal that will play and work hard through a lot of pain and not easily show any underlying health problems. It often takes a sharp and observant owner to know whether or not his or her dog is suffering from any type of pain or illness. and giving your dog plenty of exercise and attention to keep him healthy. Another way of keeping tabs on your German Shepherd Dog's health is by performing a weekly home German Shepherd health exam. This will help you spot many of the common German Shepherd health problems before they become serious. This will also make you very aware of your GSD's body and easily help you detect any changes that may happen over time due to injury, disease or any kind of dog related emergencies. The best way of taking care of your German Shepherds health is by taking your dog to the veterinarian regularly. Make sure your GSD receives regular physical and health examinations and is current on all its vaccinations and worming schedule. Finding a veterinarian that is familiar with GSD Health Problems and with dealing with all the hereditary diseases that affect our breed is an excellent idea, such as Von Willebrands Disease. Not all veterinarians are as familiar with German Shepherd health issues as they might be with other dog breeds.Routine vet exams will include a check of your German Shepherds eyes, heart, lungs, ears, mouth, teeth and coat as well as any lumps, bumps, cuts or bruises that the dog may have. Associate veterinary visits with a positive experience and it will make future doctor visits much easier for your German Shepherd puppy. Another good thing to consider for your German Shepherd, dog insurance. It is also a good idea to take your new German Shepherd puppy or dog to the veterinarian for occasional "social visits" just for them to see that going there does not have to always a bad thing. Both your German Shepherds health and socialization are very, very important.Check with your vet and his staff to "schedule" a time to visit that is not too busy. The GSD pup can have both a positive and healthy experience by going there - meeting the staff, meeting other dogs and owners to socialize with, etc.Keep in mind not to introduce your dog to truly sick animals, however, since you do not want to make your healthy German Shepherd puppy ill.
Below is a list of various health disorders and diseases specific to the German Shepherd Dog. GSD emergency topics and GSD First Aid Kit Ingredients (a very good idea to keep on hand, just in case) are listed as well. You should become aware of each health condition as a GSD owner in relationship to your puppy or German Shepherd Dogs health. One thing I can suggest to you without hesitation is to get a dog first aid kit if you do not have one already. I hope you never need to use it however, if you ever need the contents of the kit and don't have one it can be really bad so save yourself and your dog the headaches and go ahead and get one asap. In the future we plan to add more detailed information covering several of the German Shepherd health related topics common to our breed listed below as well as other health related illnesses so please check back often. If your dog does get sick here are some tips for giving your dog medicine. Is My German Shepherd Dehydrated? How do you get rid of skunk odor?